Super Junior or also known as SuJu / SJ is a Korean boy band consisting of 13 members are Leeteuk, Heechul, Hangeng, Yesung, Kangin, Shindong, Sungmin, Eunhyuk, Donghae, Siwon, Ryewook, Kibum, and Kyuhyun. 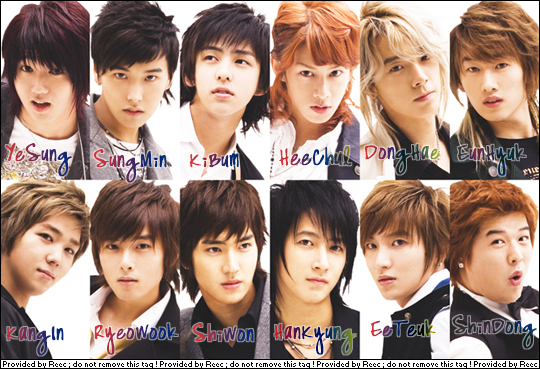 Super Junior's first debut November 6, 2005, and has successfully listed its gold ink in the music industry both Korea and Asia. The following are profiles of the 13 members. They have the numbers sorted from the date of birth. Nickname: Kim Kyu (by Heechul), Game Kyu, Ju Mong Kyu, Kyu Chic, maknae, etc. In your picture there is 12 members O.O?